Planet Goa is a popular monthly magazine covering the Goan hotspots and the monthly happenings of the state, so when they decided to come out with their selection of Goa’s culinary best, it truly demanded a reading. Goa with it’s myriad hues of cuisines was truly in need of a comprehensive guide to its various eateries. Sure there is the times good food guide, but Goa has a diverse eating culture from five start cuisine to beach side shacks, from bars and discotheques which also serve snacks to sit down dinner places, to places which are open all year round to the places which mushroom during the ‘tourist season’ of November to April, and such diversity requires an indepth analysis of the food scene of the state. 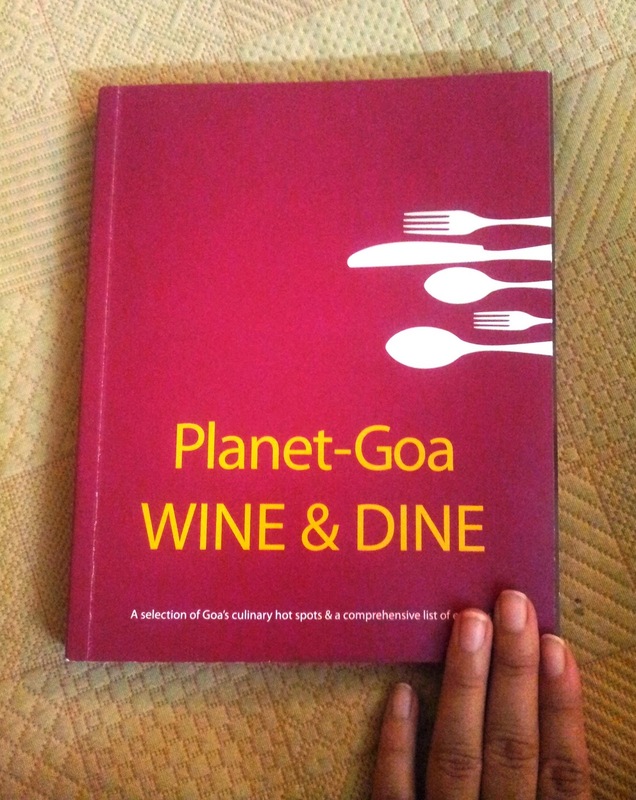 So, is planet Medias’ Wine and Dine book the answer to the wine and dine scene of Goa? 1.The beautiful cover of the book: it’s a rich maroon with a few forks and spoon silhouttes along a border. I liked that they hadn’t chosen a particular dish to grace the cover picture. 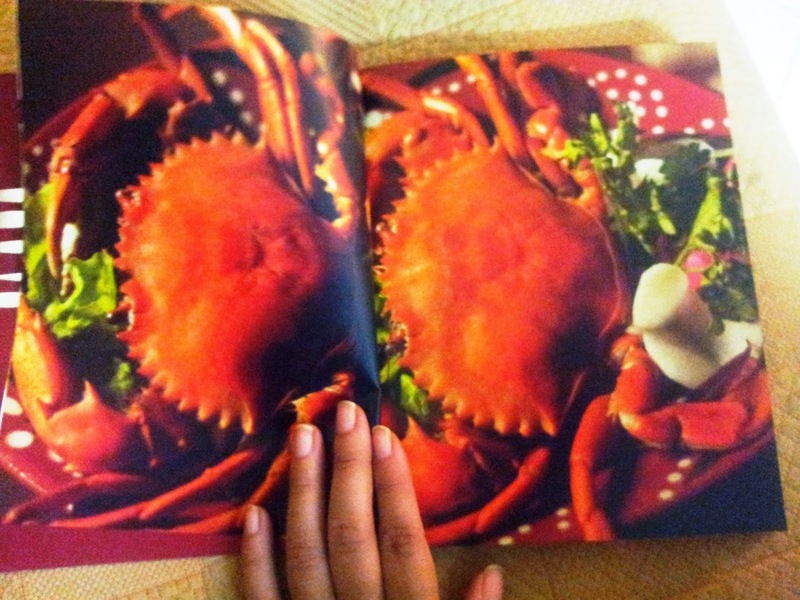 This book mentions in a place that Goan food has become synonymous to sea food, and that has marginalised the lesser known but equally tasty vegetarian and other meat preparations. Atleast the cover of the book seems impartial. 2. A brief introduction to the Goan cuisine at the beginning of the book: a section called food files written by a host of eminent writers, foodies and even fitness expert delves into the veggie delights, world cuisine , wines and desserts of Goa. It even has a section with the Goa food dictionary. Interesting, especially for the tourist population. 3. A small write up of the owners of the restaurants accompanied each review: A sweet gesture which gave a face to the places and introduced the people behind the ventures. 4. important information about the restaurants: As mentioned earlier not all eateries are open all year long. Infact we had once gone to a popular greek restaurant in Vagator in the pouring rain, only to reach and find absolutely nothing and no one at the site. The book mentions important things like places which accept only cash ( a lot of famous places especially in the northern sea shore do not accept cards), which places have valet parking, which ones have home delivery, and also phone numbers for reservation. 5. 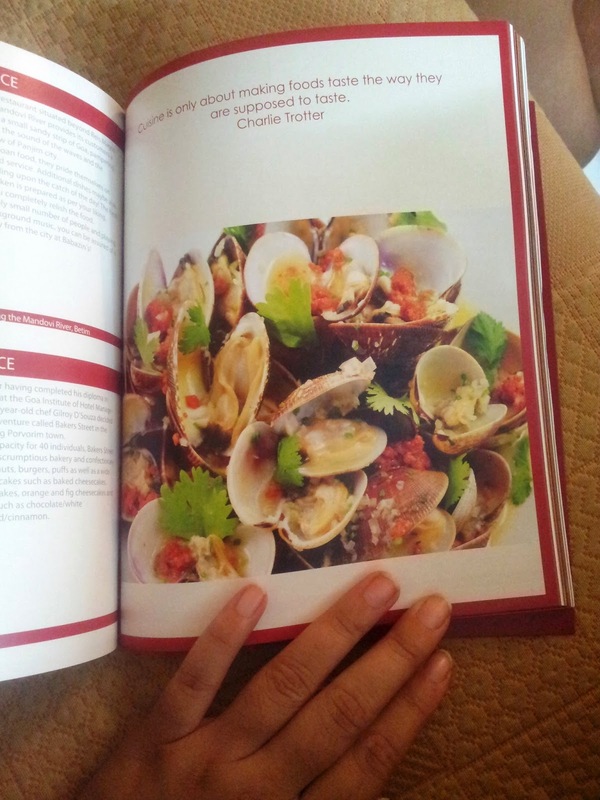 A few recipes: Its always exciting to have recipes in a restaurant review book, it’s like the free toy in the cornflakes box. 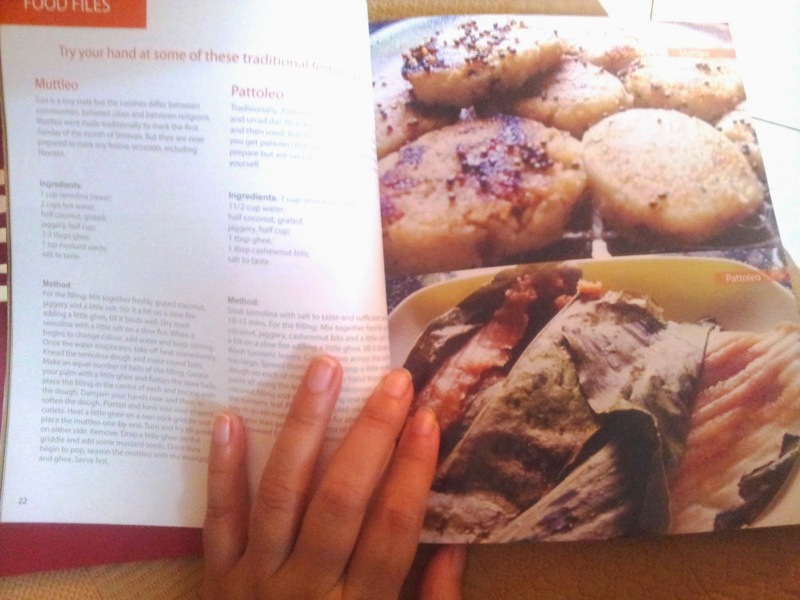 There are a few sweet dish recipes and I wish they had included a few more basic Goan recipes like Khatkhate, a simple fish curry and xacuti. 6. Beautiful quotes on food: gorgeous pictures of food interspersed with quotable quotes by Julia Child and Oscar Wilde make this a coffee table book. It’s something to browse through and feel inspired by all the epicurean delights. Sea food at its best !! 1.No titles to the pictures: A book on food is in a large part about the pictures, and this book has a large number of delicious pictures, but none of them have titles. Is it a garlic butter prawns, or a honey ginger glazed one, the pictures do not mention. If the food is indeed from the restaurant mentioned then I’d like to know what to order if I like the way a particular dish looks. 2. Some write ups are too pretty: Some of the restaurant reviews are so full of wonderful adjectives, it reads like an advertisement rather than an impartial review. There is a particular review in which they mention how the soulful sufi music serenades us while we tuck into our food. I have been to the mentioned eatery and we were treated to the Bollywood music from Jab tak hai jaan and the album played three times !!! We actually asked them to turn the music off. 3. The book is not a fun read for vegetarians: At one point in the book they mention that they would like to break the myth that Goan food, or food available in Goa is not vegetarian friendly, but the book has a quote on page 178-vegetarians and their Hezbollah like splinter faction, the vegans are the enemy of everything good and decent in the human spirit, Anthony Bourdain . That might not be the best way to win vegetarian readership. 4. A lot of the pictures look the same: all the pictures had a lovely white background and gleaming white plates, none of them had the restaurant insignia, which made me feel that the pictures were taken in a studio and may not be representative of the food available at these eateries. Yes for a book of this standing the pictures could not have been candid shots taken in poor lighting in the restaurants itself, but a mention of the name of the dish and the restaurant would have given it more credibility. 5. No pictures of Bebinca and Dodol: In a whole article on the desserts of Goa, there were pictures of cheese cakes and none of Bebinca and dodol which are indigenous to Goa, and a popular souvenir that many tourists take back home along with packets of cashew nuts. Yes, the book could have been better represented. I missed seeing a few of my favourite places in the book, while I found a few interesting ones. Ofcourse it is solely the discretion of the authors of the book, who have done a commendable job of bringing a slice of Goa in the form of a delectable book. This is the kind of book you can curl up with on a rainy day in Bombay, and dream about the sunkissed beach shacks of Goa, or as a gift to someone visiting the state, it is also a handy reckoner for locals. On days when I am in a dilemma where to eat, I can just close my eyes, flip to any page on the book, and make a reservation for the restaurant on that page. This book can make eating out in Goa fun!